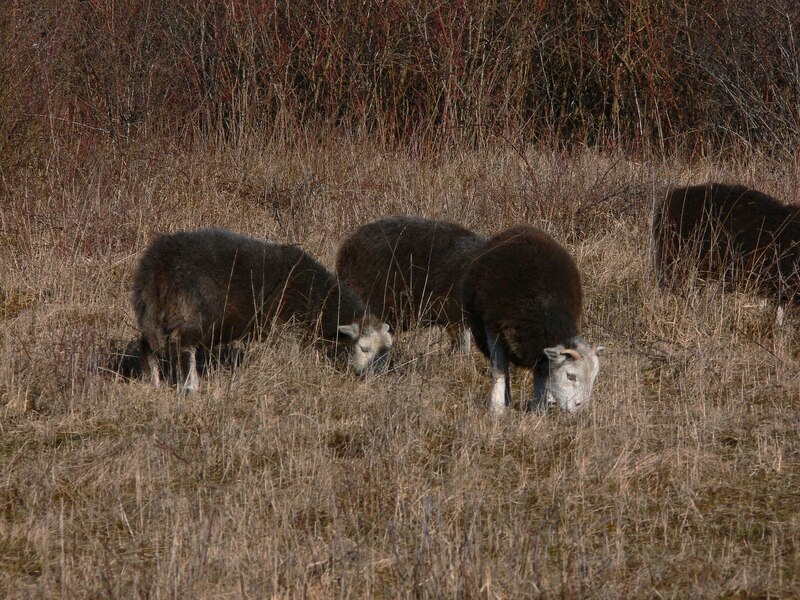 Banstead Botany Blog: Conservation grazing??? Chalk grassland is very much an artificial habitat around here, requiring management to prevent natural scrub progression occurring rapidly. The usual way to deal with this is by winter grazing with sheep or goats and on Banstead Downs there are a number of areas that have been grazed for over twenty years on a three/four yearly rotation. This year a small flock of Herdwicks did the sterling work through all the snow and cold weather (below). 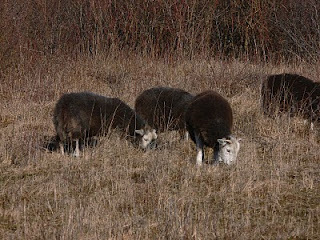 Their grazing opens up the sward and helps to maintain a low soil fertility level, in addition they do tend to nibble at some of the scrub. The important thing is they are removed in the early spring so that they do not eat the hopefully burgeoning flora! A similar pattern of management on Park Downs to the south of Banstead has been interrupted following a dog attack a few years ago that resulted in the death of a number of goats. One of the the dogs is still around and forage harvesting has been used to keep the herbage down. Not ideal. Recently however, nature has decided to help in the form of the local rabbits. Park Downs has had a rabbit population that for the past ten years at least has varied over a fairly regular two to three year cycle. Once they reach a certain density, myxamatosis appears and the numbers drop down, they then recover and the cycle repeats itself. The past two years have seen a break in that cycle, numbers have increased continuously and have reached very high levels with no sign of myxomatosis yet. Rabbits tend to have "favourite" feeding areas and rather than graze the whole site lightly they create small areas of close-cropped lawns and although the botanical diversity increase in those lawns, they have only a small impact on the site overall. This cold winter and increase in numbers has however seen a dramatic increase in the area grazed and the effects are beginning to be seen. On the good side rabbit grazing tends to favour the growth of less coarse grasses offering an advantage to other chalk grassland species that cannot normally competee hence species diversity increases, It also alters the physical characteristics of existing species, for example Cowslip, the picture below shows this plant growing fairly typically in a non-grazed area (left) and a grazed area (right), the plants are about 1/3 of the size, quite a difference. It doesn't help that in the latter example something nibbles the flowers just as they open, neverthless the species is increasing even in those areas. On the bad side, in the short term rabbits do not restrict themselves to grass and many plants fail to flower especially orchids that have there flowering stems renmoved as they elongate. In the long term, the effects can be more serious in that in well-grazed areas rabbits tend to dig for roots etc (I assume) and this can lead to rapid degradation of the sward. This is just beginning to happen in some areas on Parks Downs. It is a great shame that the rabbits can't be removed for the summer, proper conservation grazing! Your comment that chlak downland is an artificially-maintained habitat rings true - without herds of cattle, ponies or goats much of the local reas would quickly revert to scrub. Rabbits seem to prefer farmers' crops to tor grass and sycamore seedlings unfortunately. Without grazers the downland is fighting a losing battle.